Automator is one of the my favorite new features in OS X; it allows non-technical users to create seemingly complex programs to handle mundane tasks. Not only that, but these new programs can then be hooked into Automator’s contextual menu in the Finder via a simple Save As, and you have the beginnings of the ultimate power tool. As such, expect to see a number of Automator-related tips here in my blog, including today’s entry. To further differentiate clients, you also use Finder Labels to color-code your top seven clients (as there are seven colors available). Your system works great, but creating the folders is a time-consuming process. Enter Automator, which can make the task nearly effortless. Rename Finder Items— yes, drag it twice! You now have the shell of your Automator action for a given client. Here’s what each command does, and how to customize the settings for a given client. I’ll use the settings necessary to create folders named as shown above. If you’d like a different naming scheme, just change the various values as needed. This action creates a new folder in the Finder. In the Name field, enter the name that you’d like the folder to have. In my case, I entered “Client ABC |”—notice that there’s no trailing space after the pipe (vertical bar). Set the Where pop-up to the desired location for the new folder. Unfortunately, Automator doesn’t offer a “In the current folder” location option, so you’ll have to pick from one of the pre-defined save points, or use Other to pick a specific location. I left mine set to Desktop, which makes it easy to then drag the finished folder to its desired final location. That’s how the completed action should appear with the edits in place. Note that you should make sure that Year comes first in the Format pop-up—this will insure that the Finder sorts these items properly, in date order. With these settings in place, the folder will have ” YYYY-MM-DD” appended to its existing name. This will put an “_n” at the end of the folder’s name, where “n” is the numerical sequence number. This leads to a folder with “_nnnnn” appended to its name, where “nnnnn” is the number of seconds since midnight. Now would be a good time to compare your action with this screenshot of my completed action. They should either be identical, or they should only vary in those ways that you changed—file names, formats, etc. Once you’re sure you’re ready to go, click the Run button. The result should be a named and labeled folder in the location you specified. But why stop with just client ABC? Modify the action as necessary for your other clients—probably just chagning the label color in the last item—and save each modified version as its own Finder plug-in. Now you’ve got seven easy-to-use, always available, commands to create your specially named and labeled folders. The scenario in this example may strike you as a bit contrived; that’s OK if it does. 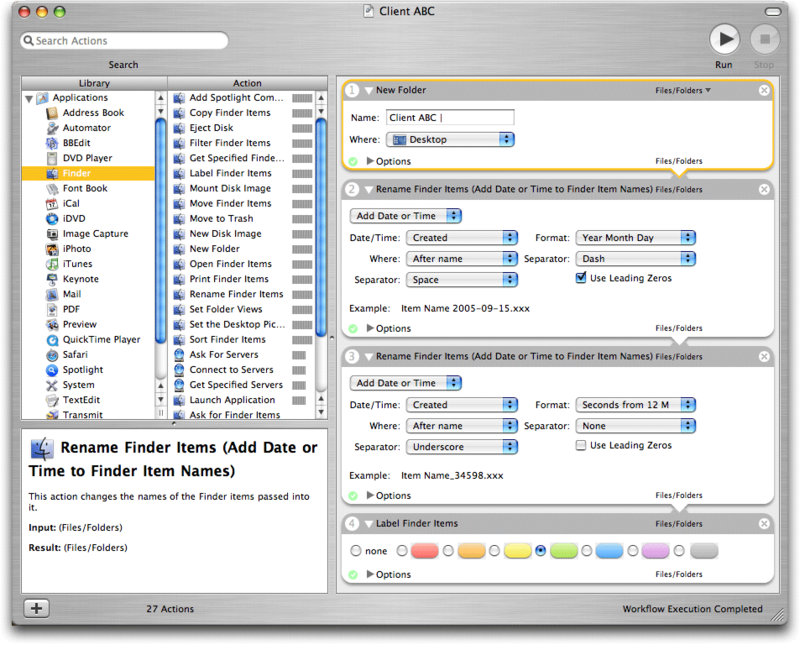 The bigger picture is that Automator makes it very easy to create your own customized Finder folders. Play around with renaming and labeling, and you’ll find you’ve got a powerful timesaver at your fingertips, regardless of your actual workflow needs!